I’ll try to be independent as much as possible when Hubby is not in town, in terms of going to places. I foresee that Hubby will be travelling very often, and I do not want to be stuck at home, going nowhere, just because he’s not here to drive me around. I need to be fair to my children. It’s not that I’m against the idea of staying home, but IF they stay home, their companion will be either the TV, PC, Ipad and handphones. So they need to go out. Like today, all of us went out, even though not together. My KSS sisters and brothers came for a visit, to bring Afrina and Affandy to a Selawat Session at Ustaz Shafi’s house at JB. Afiqah and I had to stay behind as Afiqah could not afford to be absent from her tuition. They were all dressed up in black for the Selawat session. If it’s not because of Afiqah’s tuition, I would dress like them and join them. But nevertheless, I had fun with Afiqah today. 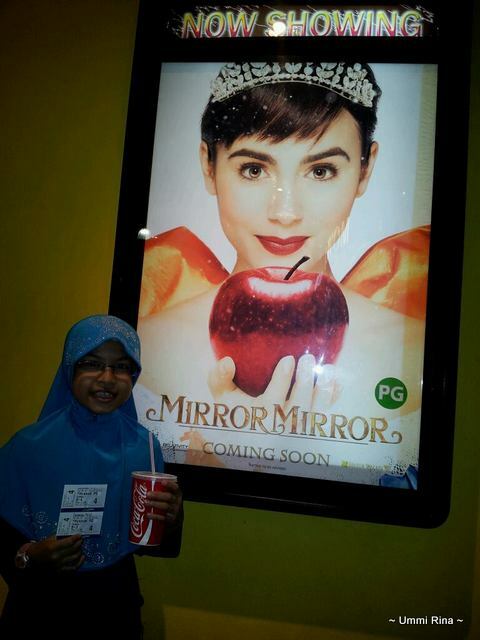 After her tuition, we watched the movie “Mirror Mirror”. She said she loves it when only the two of us go out. No interruptions. I get what you mean, girl. I feel you, too. But I still miss my two other muchkins. 🙂 Err….three actually, including Hubby.